Stacy Horn » Blog Archive » Please may I eat it? Please may I eat it? I thought I was going to be done yesterday with the first draft of this audio forensic piece, but it looks like I’m going to need two more days. So, I won’t be able to take a break until Tuesday. Also, my publisher said they are sending the manuscript back with the tiniest, minutest, changes, but everything is mostly okay, so that sounds good. They asked for the epilogue by Tuesday, which again points to Tuesday as being Miller time. But come Tuesday, I’m not doing ANYTHING. 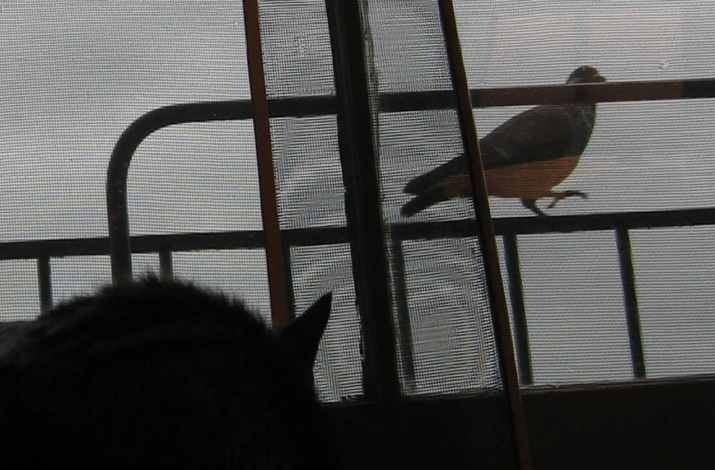 Meanwhile, here is a pigeon, dancing around on the fire escape, taunting poor Finney.